Baton Rouge, LA – October 20, 2010 – Commuters in Albany, NY, are currently part of a grand experiment, thanks to Lamar Advertising Company (Nasdaq: LAMR) and the Capital District Transportation Authority (CDTA). For the next month, people in CDTA stations and riding CDTA buses will do a double take at what first may appear to be high-tech hieroglyphics. The symbols are Quick Response bar codes placed by Lamar Advertising as part of a study into the effectiveness of this cutting edge advertising technique. 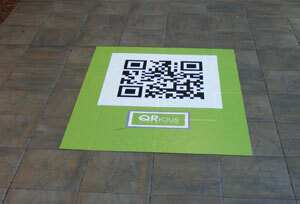 Lamar Advertising’s media space throughout the Albany, NY, market is being used to conduct the field test. 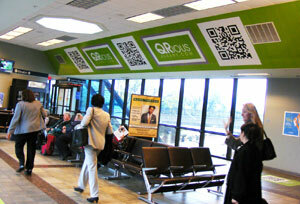 Graphics displaying the QR bar code dominate the walls, floors, kiosks and additional areas in Rensselaer Rail Station, and can also be found in bus shelters and on the ceilings of over 50 Capital District Transportation Authority (CDTA) buses circling the Albany area. The campaign runs through November 13, 2010. A QR (“Quick Response”) code is a two-dimensional bar code that is decoded by a smart phone with a camera in order to redirect users to online content. 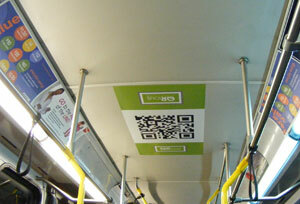 In this case, when a person scans the QR code in the station or on the bus, the user is immediately redirected to the Lamar QRious Albany website www.QRiousAlbany.com, where they can learn more about QR codes and register to win prizes. CDTA partnered with Lamar so it could learn more about its riders and find out more about the innovative technology available for its stations. On November 13, 2010, Lamar will randomly draw the winners of the QRious contest. The first place winner will receive an iPad (courtesy of Lamar Advertising) and twelve other winners will receive a CDTA 31-day Rolling Swiper card valued at $65 each (courtesy of the CDTA). 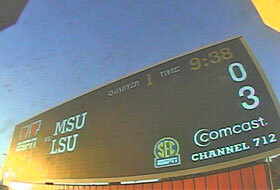 Lamar Advertising Company, a leading owner and operator of outdoor advertising and logo sign displays, has launched a digital billboard campaign with ESPNU and MacDonald Media. 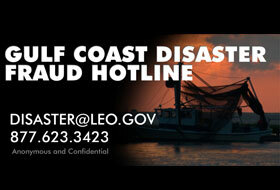 In the wake of BP’s announcement to allocate funds for oil spill victims, Lamar donated space on over 50 digital billboards as part of the NCDF’s campaign to prepare for the potential fraud calls associated with the Deepwater Horizon Oil Spill Recovery.